Let's update one measure of housing prices: comparing of the purchasing power of buyers vs. the price a typical house. There are at least 3 indexes. 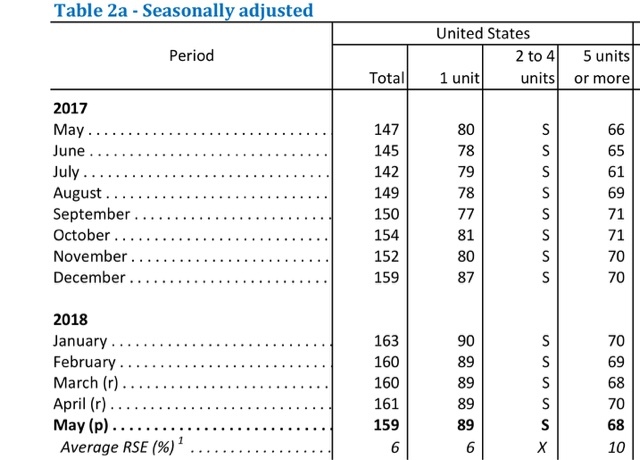 Note that the data isn't seasonally adjusted, so there is an annual cycle. 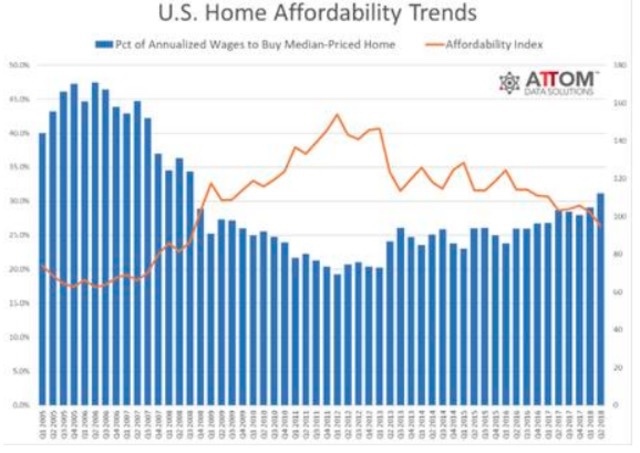 Even so, it is clear that affordability is at its lowest in 10 years. But on the other hand, the index is nowhere near its lows of 2005 or 2006. This, like the N.A.R. 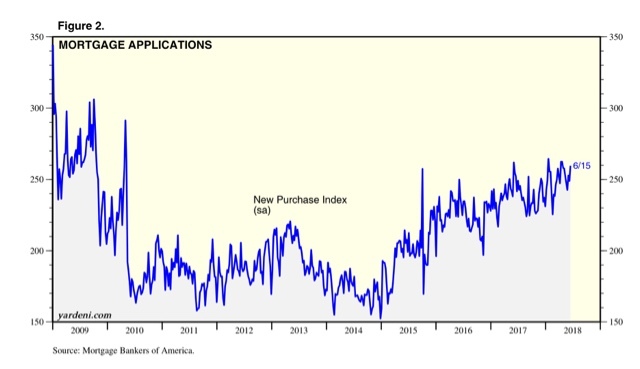 's Index, just made a 10 year high, or low, depending on how you look at the data, but again, is nowhere near the level of u affordability from the peak of the housing bubble. 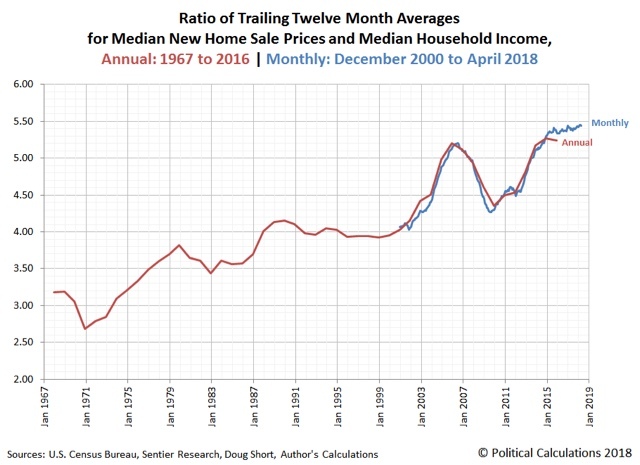 New houses, as opposed to existing houses, are at new all time highs, even as compared with the peak of the housing bubble. The sharp difference in affordability between new and existing houses is probably the main reason why existing houses most recently have sold after an average of only 27 days on the market, and months' inventory of existing houses is at all time lows. Finally, just keep in mind that this measure does not tell us what the monthly mortgage payment for the median house will be. Because interest rates, even with recent increases, are still 1%-2% lower than they were during the 2000s housing boom, the monthly mortgage payment is nowhere near an extreme at this point. The housing market generally proceeds according to an established cyclical rhythm. My post describing the current status of that cycle as measured by interest rates, sales, prices, and inventory can be found at XE.com. Here are some additional salient comments about the housing market right now. In May 2015, houses sold at a 5.35 million annualized rate. In today's repot they were reported as selling at a 5.43 million annualized rate. This, of course, is at complete variance to the very positive trend of new home sales over the last three years. There was a great article this morning on housing over at Barry Ritholtz's The Big Picture. Be sure to read it all, but here are a couple of important graphs from the piece. The K.I.S.S. 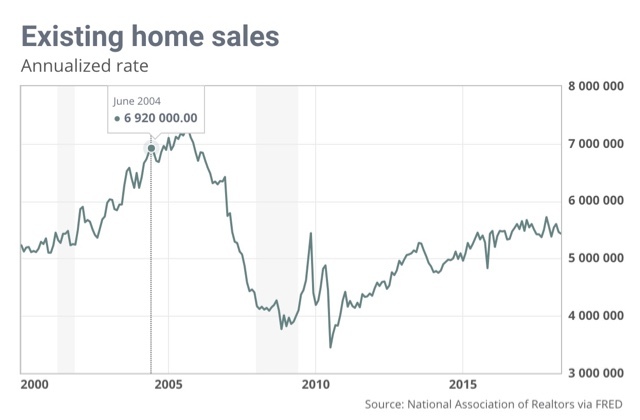 explanation is that *prices* of new and existing homes have been moving roughly in lockstep, up about 6% YoY by nearly any measure, for the last 5 years. Pricewise, they have established a stable equilibrium. Thus, the other measures tend to gravitate back to whatever is necessary for that equilibrium point. Meanwhile, the size of new houses has increased by 10%. That obviously explains some of the difference, but there is roughly another 20% that isn't so explained. The one possible explanation that isn't covered in The Big Picture piece is whether wealthy foreign (mainly Chinese) buyers are driving up the prices of (the relatively luxurious) new houses. I haven't seen any good articles about this for about three years. At that time it looked like foreign buying might be declining, but maybe it has picked up again since than. If the profits in new homes are at the luxury end for wealthy foreign buyers with whom in the aggregate domestic buyers can't compete, that would drive domestic buyers to the "substitute goods" of existing homes. But that same dynamic would mean that *owners* (and potential sellers) of existing homes also, relatively speaking, would be unable to afford selling and moving up to the relatively luxurious new homes. Thus existing home inventory would be capped. Foreign buying is an excellent fit for the missing part of the puzzle. I just don't know if it is factually true. 5. In the aggregate, there's not enough evidence that the housing market is at its peak. but they are still running, on average this year, roughly 3% higher than their level of last year. Yesterday I wrote of a poor report for single family housing permits, While I think the preponderance of evidence is that they are on the cusp of at least trending sideways, I should clarify that there have been several times during the last 5 years when permits have pulled back about 4% from the peak. The difference is that the pullback only lasted 2 months and then permits rebounded. This time the decline has lasted 3 months so far, and while we don't know what the future holds, the fundamentals of interest rates and prices have not improved. 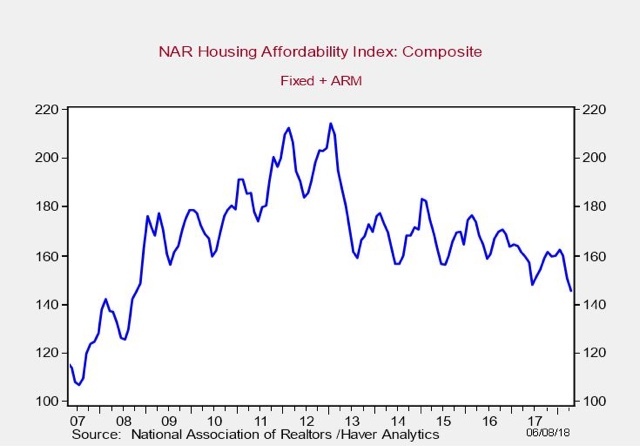 The preponderance of evidence, based on this morning's report on housing permits and starts, is that increased interest rates and continuing increased prices are beginning to take a bite out of the market. Both declined this month, but more importantly, both made 7 month lows. Outside of the expiration of the housing stimulus way back in 2010, this is the first time that single family permits have made this significant a decline -- off about 4% -- during this expansion. 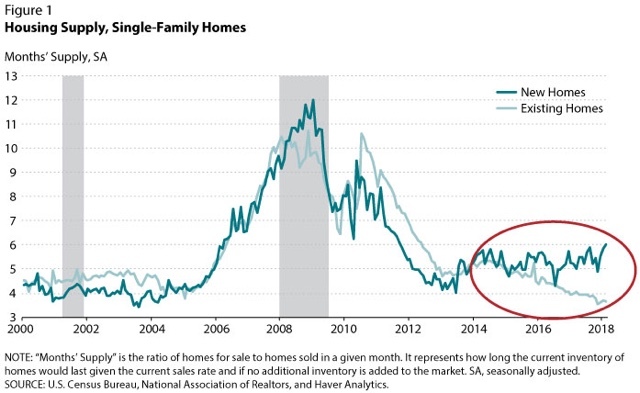 At the same time, since the peaks for single family homes were only in February, and overall in March, not enough time has passed to be confident that this was the peak. This includes on a three month rolling basis, which cuts down on volatility. So it is not a surprise that starts have continued to rise even though permits have declined in the last several months. 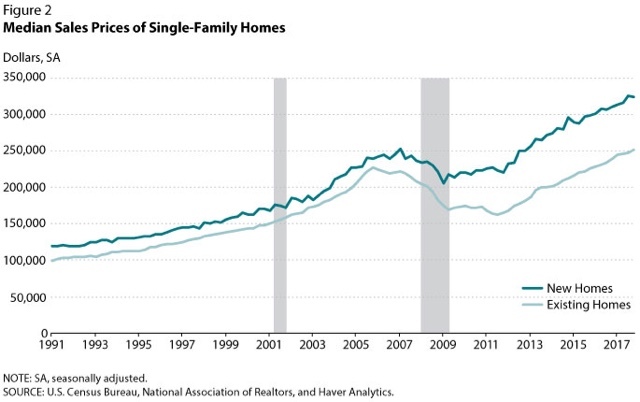 Should single family permits fail to make a new high for at least one more month, and should the decline be over 5% from peak, I will switch their rating from positive to neutral. And, while the evidence is by no means conclusive, I would say the preponderance of the evidence is that housing is slowing down, and that will have an effect on the economy over the next 6 - 12 months. 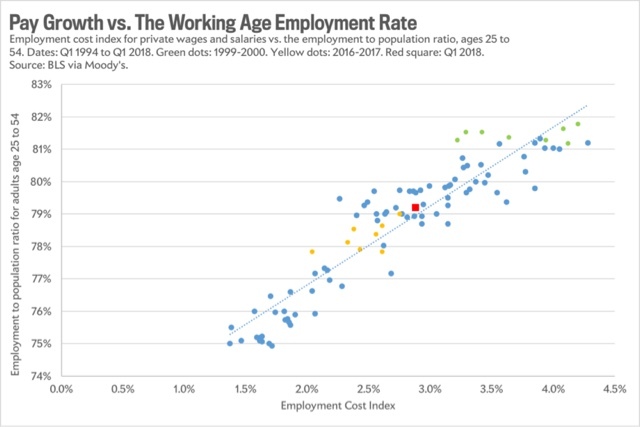 Easy to see, there is what looks like a nice, nearly linear relationship between the prime age (25-54) employment to population ratio (left scale) with wages as measured by the employment cost index (ECI)(bottom scale). While I see some merit to the approach, I don't think the graph actually means what its purveyors think it does. Same pretty linear relationship, with maybe a slight bend at area of 79% participation and 2.5% wage growth. Same nice relationship, with a little bit bigger kink at the same point in the graph. Once again, same nice relationship, with more of a kink at that same point in the graph. Hmmmm, I don't think that is the same nice relationship whereby both increase and decrease together, do you? Nope, that is not really helpful proving the case either. Let me emphasize the I do think there is some merit to the approach. 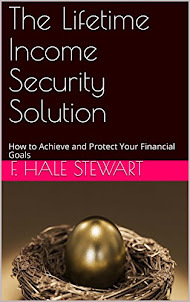 But at least part of the problem is that the labor market can only absorb so many new entrants at any given time, and when too many new entrants saturate the job market (as during the time that tens of millions of women entered the market during the 1970s and 1980s), wages will be depressed. In short, it looks like the nice neat relationship between prime age employment participation and wage growth disappears when we use other measures of wages, and also when we apply it to prior periods. Donald Trump has a negotiating tactic he really likes: Threaten to do something someone else will really hate, and then offer to stop if they give you what you want. Call it the "Why are you hitting yourself?" approach to diplomacy. Trump's theory of immigration politics [is that] if he shows a willingness to be more cruel, he thinks that will force Democrats to the table, and that they will essentially bribe him into not mistreating vulnerable people by enacting immigration policies he's long wanted. Look at this hostage I've taken, he thinks. How could they possibly let me shoot it? Like Dreamers and SCHIP recipients, the children of migrants are the most vulnerable, innocent, and helpless of all. Deliberately inflicting suffering upon them will call forth tidal waves of sympathy (witness the White House press conference the other day). So to the amoral and those without consciences, they become the perfect hostages. For that very reason, we should expect that children will be targeted again and again and again throughout the Trump presidency, and that once he has pocketed the ransom, the moment that he the ability to renege on the deal, and take the same hostages all over again, he will do so. Thus, for example, already we hear that funding for SCHIP, which was agreed to for 6 years under the February budget deal, is nevertheless again being zeroed out by the House GOP's proposed budget for next year. In government, a combination of pride and political constraints make it very difficult for Trump's counterparties to take the hit and give him what he wants so he will go away. Plus, they know they will have to deal with him in the future and had better not get a reputation for folding easily. (Chuck Schumer -- who in a panic last February indicated a willingness to vote for funding for Trump's wall, and thereby conceded his leverage on that point -- for your homework write that last sentence on the blackboard 100 times. Not only was poor procedurally, but a completely unsurprising outcome is that Latinos apparently drew the conclusion that Democrats had abandoned the Dreamers after paying lip service to their plight, and are the one minority unenthusiastic about showing up at the polls this November). Being cold blooded and steely means potentially making the hard decision to protect Dreamers who are already Americans in every way but legal citizenship vs. migrants who are just arriving or may arrive in the future. But above and beyond that, it means using a fine tooth comb to examine, and reject, any deal if there are "trap doors" which would allow Trump of the GOP to renege before the gains to the hostages are realized, or to retroactively undo those gains. Because at the end of the day, appeasing hostage-takers never works. And alas, for the next 2 years and 7 months, the entire world must deal with and face down the hostage-taker in Chief.